The best way to describe the home is the 5 Star Reviews. While I strive to make you feel like its home while your here, many guests speak of more than they expected. Also keep in mind that as a VRBO listing I do not have the option to select what review to keep or delete. Every review that any guest has ever posted is here since the property was listed on VRBO. 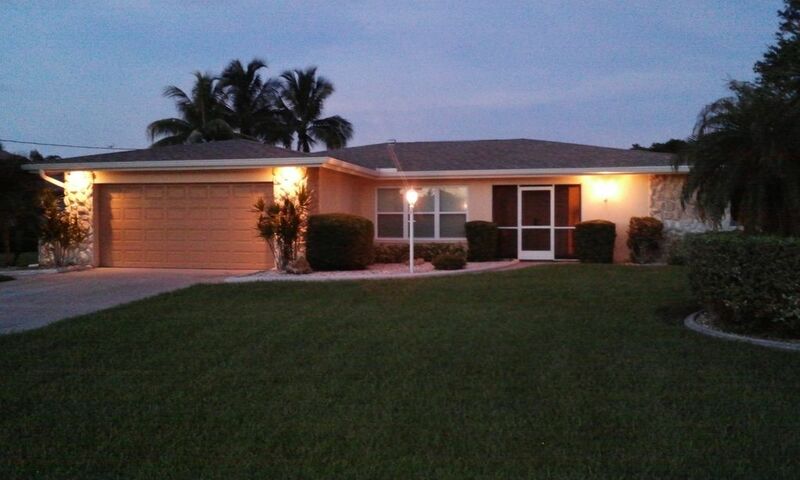 So here is your private home in desirable southwest Cape Coral. 120 feet frontage on salt water gulf access canal with dock, boat lift and electric heated pool. Over 1800 square feet under air includes all that southwest Florida has to offer. The pictures are current and tell the story except that reviews say its better than the pictures. Pets welcome. Property is located south of Cape Coral Parkway and west of Skyline Blvd. Smoking is allowed outside only including lanai pool deck. Amenities include, computer workstation with printer copier scanner, high speed internet, cable TV (including outside on lanai) and telephone service. Video library with more than 3 dozen titles including Disney. Game cube and XBox. I wish to thank you for checking out our property. My name is John Bensfield and I am a CPA in Illinois, US. Generally VRBO does not want websites or email addresses listed however, if you do an internet search google, bing, etc. you will find me. Price is very reasonable. The pictures don't lie. Private home electric heated pool. Why would anyone stay in a condo or hotel for the same price? Check our reviews. The property in the southwest area of Cape Coral south of Cape Coral Pkwy and west of Skyline Blvd. Easy access to everything. 120 foot frontage on direct gulf access (no bridges) canal for boating or fishing. Leaf for dining room table is located in the small bedroom closet. Cable TV in living room, all bedrooms and lanai pool deck. More than three dozen movies including Disney. Games are available for Game Cube. No games available for Xbox. Electric heat not solar. Pool toys, floats and a life jackets for kids all located in the pool box on the north side of the house. We had a very enjoyable time we didn't have the weather we would have wanted but your home made it nice. We truly enjoyed our stay. The heated pool was wonderful and having the canal out back was plus for my husband to go fishing any time he wanted. Would stay here again. Very clean and comfortable home. The house is very well decorated and very clean and comfortable. The kitchen is very well stocked including spices. You really do not have to bring anything in the way of cooking. The Lanai has a nice outdoor table and chairs and the pool was heated and very clean. I would highly recommend this place, but as with all the VRBO homes, the rate advertised does not included all the fees. We stayed 30 days and that works out to be more like $186 per night. However, on the VRBO site, you will be hard pressed to find a home like this in Cape Coral for that price. Plus, the pet deposit was only $45 which is really cheap. I'm enjoyed our visit and would recommend this place to anyone. Teresa, I want to thank you for the review and while it shows only 4 stars I feel your words say 5 stars. In addition you are absolutely correct about your total nightly rate. While listings indicate the base daily rate to that amount, as Teresa mentioned, we do add a fixed charge for pets and cleaning whether someone stays a week or a month. The unexpected comes from HomeAway service fee, property damage protection and sales tax. The biggest portion of course is Florida and county occupancy sales tax of 11.5% which is assessed and paid just like any other hotel motel. Reviewing your total for these charges calculate at $28 per night for your stay. As an owner we do not assess or receive any of these fees. The perfect, relaxation hideaway for a dream family vacation! We absolutely loved our Cape Coral vacation, and the home we stayed in made all the difference in the world. The place was clean, fully stocked well maintained, and a great one-story layout. The pool was enjoyed by all, too! Rates are based two bedrooms and 4 guests. Additional fee applies with more than 2 bedrooms or 4 guests.